The OCTOPUS web interface. Overlaying an adaptively scalable Google Terrain Map, sampling points and catchment polygons can be interactively interrogated, and studies of interest can be selected for download (credit: Henry Munack, University of Wollongong). In geomorphology, radiometric dating methods have been on the rise during the past decades. Notably cosmogenic nuclide applications and luminescence dating gained great popularity because they quantitatively capture geomorphic processes on their process-inherent timescales. To date, globally more than 4,200 in situ detrital catchment-averaged 10Be data are available, forming a highly variable, statistically resilient dataset that represents substantial effort of both capital and labour. However, published data are often still inaccessible to researchers, are frequently subject to lacking crucial information, and are commonly different in underlying calculation and standardisation algorithms. Resulting data disharmony has confounded the purposeful (re)use of published 10Be-derived data, for instance for inter-study comparison, for looking at the greater picture of Earth surface’s downwearing or for innovative data revaluation. 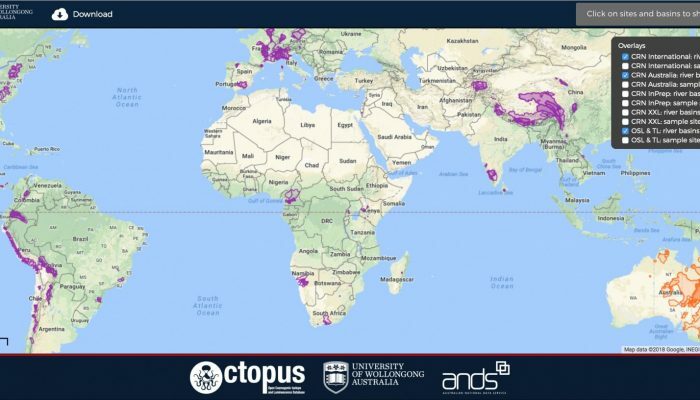 Aiming to do away with these problems, OCTOPUS: An Open Cosmogenic Isotope and Luminescence Database has been made available online under the lead of the University of Wollongong (UOW) and with support from the Australian National Data Service (ANDS). Data are hosted and maintained at UOW and are available to the research community via an OGC compliant Web Map Service. The cosmogenic radionuclide part of the database consists of 10Be and 26Al measurements in fluvial sediment samples along with ancillary geospatial vector and raster layers, including sample site, basin outline, digital elevation model, gradient raster, flow direction and flow accumulation rasters, atmospheric pressure raster, and nuclide production scaling and topographic shielding factor rasters. The database further includes comprehensive metadata and all necessary information and input files for the recalculation of denudation rates using CAIRN (Mudd et al., 2016), an open source program for calculating catchment-averaged denudation rates from 10Be and 26Al data. The luminescence part of the database consists of thermoluminescence (TL) and optically stimulated luminescence (OSL) measurements in fluvial sediment samples from stratigraphic sections and sediment cores from across the Australian continent and includes ancillary vector and raster geospatial data. You are invited to download the data and take part in the discussion.